Award-winning innovative workshops helping you deliver the curriculum through outdoor learning in parks and gardens close to your school. Most sessions can be booked all year around across the seasons. All workshops can be adapted for small groups of children with SEN. Cost: £150 per two-hour session (maximum 30 pupils) or £250 for two sessions in one day or one full day. Book 10+ two-hour sessions for a reduced rate. Get information to help prepare for your visit. Get up close to a variety of plants, developing knowledge of the function of roots, stems, leaves and flowers. Get to know the lifecycle of a plant and what it needs to survive. Hands-on activities include digging up roots and a plant ID hunt. What Lives in the Park? 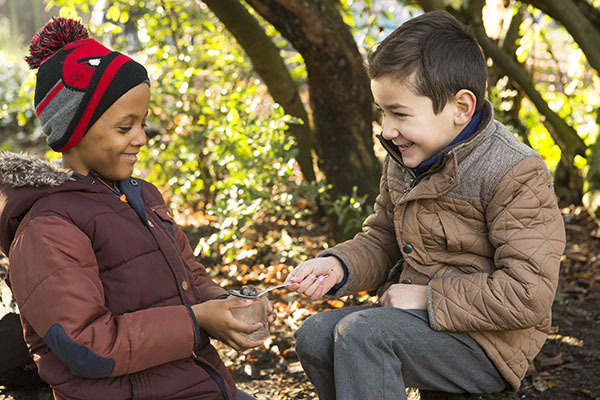 Identify, observe, predict and record findings in a mini beast hunt and pond dipping discovery using simple equipment. We uncover woodland and wetland habitats and work scientifically to develop an understanding of food chains and what is living, dead and non-living. Using all the senses, build vocabulary, knowledge and enthusiasm by exploring different trees. Work scientifically to record observations and label trees, and differentiate between deciduous and evergreen. Transform your class into poets. Choose between water, trees, or butterflies as the theme of your session and hone poetic techniques and enjoy spoken language activities exploring simile, rhyme and alliteration. Use the natural environment as a stimulus for creative narrative work. Choose between either water or trees and develop a structured plan for an original story. Take inspiration from both observation and imagination, and explore how the senses in writing can make description even more powerful. A great way to combine food technology, maths and science and engage your pupils in where food comes from. We plan, harvest, and measure out ingredients to create individual pizzas from scratch cooked in our clay pizza oven and enjoyed by all. This full day session combines discussion on diet, nutrition and exercise with garden exploration to see how food grows. For a class of 30 at a cost of £270. If you’re looking for a half-day food technology experience, book this session and get the whole class involved in shaking up ingredients that transform into churned butter. Discover growing garden fruits with traditional preservation techniques and work in groups to make dough for bread rolls to take back to school. A fun and fast paced food session! Morning session preferable with opportunity to bring and eat a packed lunch on site. £150 per 2-hour session.